I really like this series and very much excited about it. 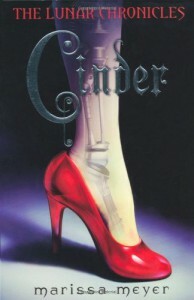 Marissa Meyer writes well and plots the story in an engaging way. The premise itself was so full of promise and Marissa Meyer doesn't disappoint. It's not as dark or deep as I prefer my stories to be but within its own parameters it is a retelling of a classic done with wit and wonder. Cinder is an amazing characterization. Strong by default. Kai has a interesting personality too but a lot of his struggle focuses on the external rather than internal, but that's just a personal preference. A lot of the criticism for this book revolved around a simplistic plot and though I would agree that its target audience is lower end of this market, I can't deny that I thoroughly enjoyed reading this book. I took a point off for that cliffhanger which was huge. Otherwise highly recommended series.